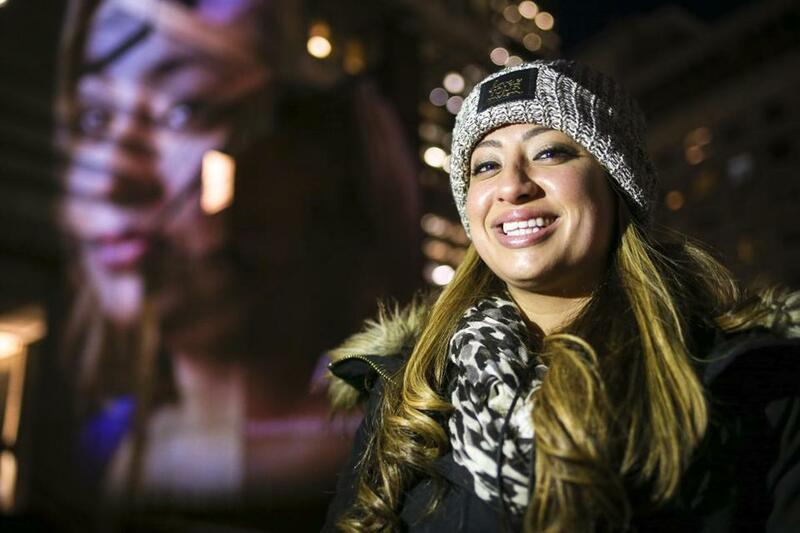 Arista Lee, who lives with hereditary angioedema, had her portrait projected onto Boston City Hall Thursday evening as part of an event marking Rare Disease Day, which aims to bring awareness to the issue. If you looked at Arista Lee, you probably wouldn’t know she was sick. For a long time, she didn’t know, either. But then her twin sister, Arielle, was diagnosed in May 2012 with hereditary angioedema, a rare disease that causes aggressive swelling of body parts including the face and throat. Hereditary angioedema is genetic, so when Arielle showed symptoms, Arista was tested along with her for the disease as well. The test revealed she, too, had hereditary angioedema; the symptoms just weren’t showing up yet. But they would. Now Arista, 28, takes precautions to avoid flare-ups, including limiting how much she drinks and making sure she gets enough sleep. She says people don’t understand why at first, but that explaining her condition can help them grasp her situation and empathize with her. That’s one of the reasons she had her portrait projected onto Boston City Hall Thursday evening as part of an event commemorating Rare Disease Day, which was launched in 2008 by a European patient group. Hereditary angioedema is a rare disease, a condition defined under federal law as one that affects no more than 200,000 people. According to federal data, there are as many as 7,000 rare diseases, and while each one is uncommon on its own, they are collectively prevalent: close to one in 10 Americans has a rare disease. Jennifer McNary of Arlington is all too familiar with the term. Three of her four children have been diagnosed with rare diseases. She says it took doctors 11 years to diagnosis her youngest son with primary immunodeficiency, despite him exhibiting all the symptoms. “The rare disease community often feels sort of invisible,” she said, citing difficulties with diagnosis and finding treatment. McNary started as an advocate for her older sons, both of whom have Duchenne muscular dystrophy, which typically affects boys. Then she became a consultant, working primarily with the biotechnology industry. McNary says that raising awareness around these conditions through events like Rare Disease Day helps to mitigate many of the challenges facing the rare disease community. She says if regulators and lawmakers understand how desperate some people are for treatment, it might help fast track clinical trials for potentially life-saving drugs. Likewise, if medical professionals knew more about symptoms of rare diseases, accurate diagnoses would come more easily. Biotech companies that develop and manufacture treatments for rare diseases, along with patient advocacy groups, pull out all the stops for Rare Disease Day. Sanofi Genzyme and other biotechs on Thursday held events in their corporate offices to mark the day, and many participated in a larger program put together by the Massachusetts Biotechnology Council. Such events also help to forge connections between drug manufacturers and patient advocacy groups, which can make it easier for companies working on clinical trials. Pushkal Garg, chief medical officer at Alnylam Pharmaceuticals Inc., said a recent clinical trial for givosiran, a drug aimed at treating the genetic disorder acute hepatic porphyria, had more than enough participants. Garg said ties to the rare-disease patients and advocates helped lead to high enrollment in the trial. Cambridge BioMarketing, which specializes in pharmaceutical advertising focused on rare diseases, put together the event on City Hall Plaza. Five portraits of people with rare diseases were projected onto the building’s facade. The display was the latest iteration of a company initiative to raise awareness around rare diseases each year. The portraits were also posted on a company website and accompanied by biographies of those pictured. “Whenever we can get exposure to this community, it’s a benefit,” Cambridge BioMarketing chief executive Maureen Franco said.